Fry the above ingredients separately in a dry kadai without any oil and let it cool. Add salt and grind to a fine powder. Store it in an airtight container. 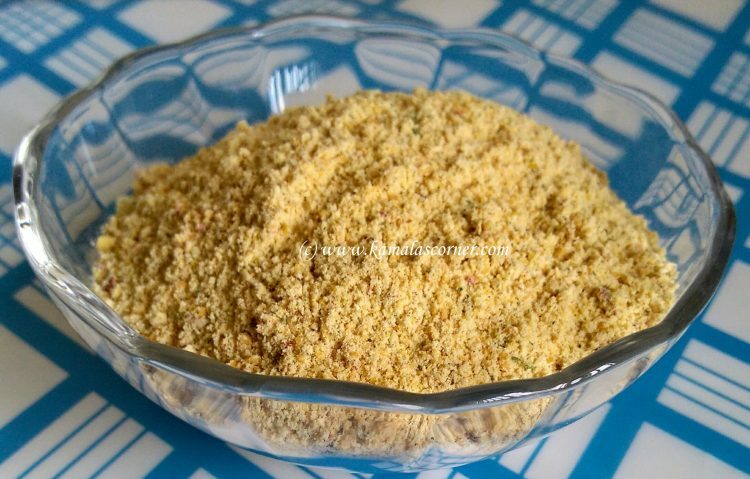 Note: You can add few curry leaves and garlic flakes also to get some extra flavor to this Podi. Mix one or two teaspoons of this powder with a teaspoon of ghee or gingelly oil to hot rice and eat with fried appalam. True. It is good to use sesame oil in cooking and also for these type of Podi/Thuvaiyal/Idli Milagai Podi etc. What to say..All you recipes are fantastic..I am now sure nothing goes wrong if i follow ur recipe and i am telling abt ur site to others..Y’day made 2 of ur recipes…Nellikai oorukai,paruppu podi ..both were too good… thanks for ur effort..Wish u all the best.. Thank you very much Jagadha for taking time and giving your feed back.